BiteGuard (Anti-Chew) large wall mounted dog door feature the industry's top chew resistance! BiteGuard KennelPlex dog doors were developed in answer to commercial kennel owners requests. The kennel owners said they wanted a chewproof door that is safe, quiet, easy to clean, and with a weatherseal a dog cannot tear out. These doors are chew resistant, safe to use, and whisper quiet. The arylic doof panel is trimmed with an aluminum guard that resists chewing. 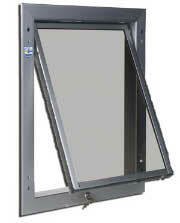 The gap between the flaps and the frame have been closed so if a dog tears out the weatherseal there is less air loss. And, the weatherseal is replaceable. These dog doors are perfect for commercial kennels where you do not know if your guest is a chewer, or for owners of labs and other dogs that like to chew. BiteGuard (Anti-Chew) wall mounted dog doors are professionally engineered and manufactured in the U.S.A. from quality materials for the optimal comfort and safety of your dog - and of course, to be long-lasting! All PlexiDor pet doors are backed by a 90-day satisfaction guarantee and 10-year warranty! All BiteGuard (Anti-Chew) large wall mounted dog doors come complete with interior pet door frame, exterior pet door frame, commercial grade anti-chew dog door, 2 keys and 4-way lock*, stainless steel hardware, and are backed by an industry leading 90-day satisfaction guarantee and no-hassle warranty! All the premium features you expect in a quality dog door - industry leading draft-proofing and energy efficiency, sturdy aluminum frame, concealed hinges, thermo-pane acrylic panels, and unsurpassed 10-year warranty. Available in 3 colors to suit every home and pet! Anti-Chew - Bite guard trim all around door panel. Secure - Doors have locks and can only be unscrewed and removed from inside your home. Close Quietly - Won't disturb you, or frighten your pet. Versatile - Unique twin panels need only light pressure to open them, so large and large pets can use the same door. includes interior pet door frame, exterior pet door frame, door panels, 2 keys and 4-way lock, and stainless steel hardware. Bite-Guard large dog doors are only available in silver.